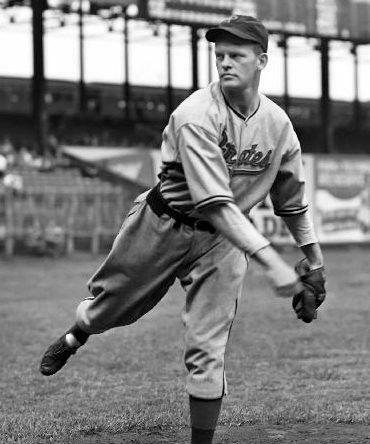 Joe Sewell went 115 straight games without striking out. He also struck out on average only once every 63 at bats. Both are MLB records. 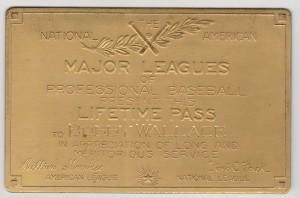 Imagine having a pass that gives you admission to any regular season Major League game for life. 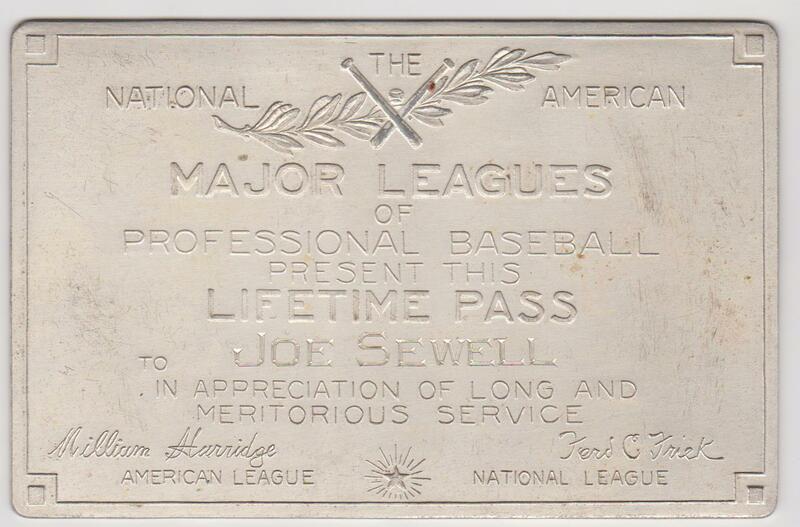 That’s what Joe Sewell had in this solid silver lifetime pass. By virtue of having played ten or more years by 1934, Sewell was among the first players to receive the gift. 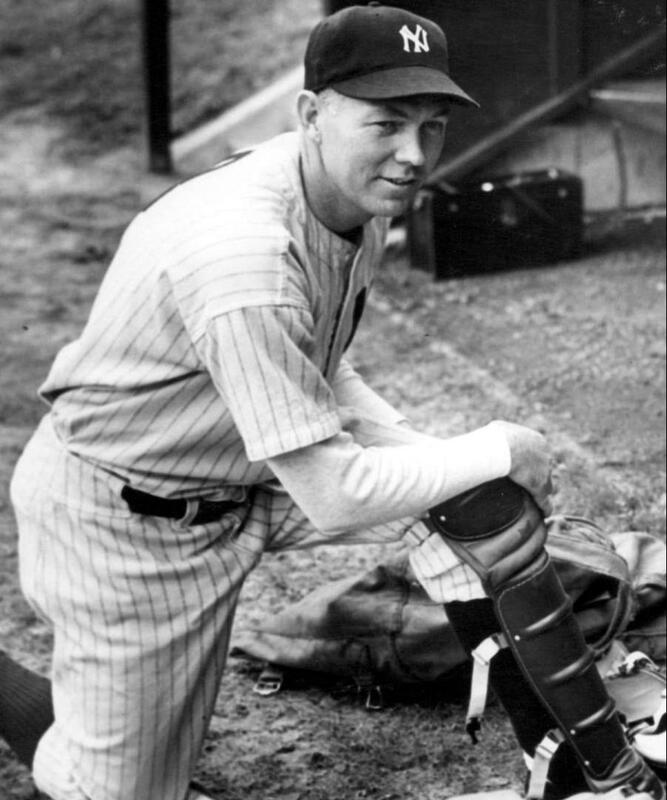 A master of bat control, Sewell never struck out more than 20 times in a season. 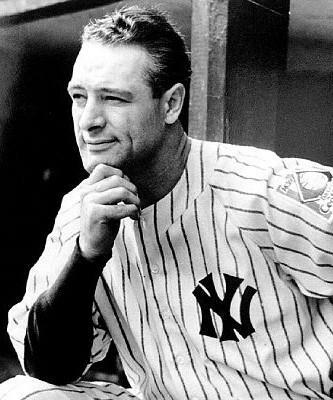 His strikeout totals reached double digits only in his first for season and never again throughout his 14-year playing career. One of the most mythical events in baseball history came during Game 3 of the 1932 World Series. Did Babe Ruth call his shot? Joe Sewell was there that day and was asked to recount his memory of the event. Did it happen? “Yes,” Sewell writes. “I hit ahead of Babe in the lineup, second to be specific. 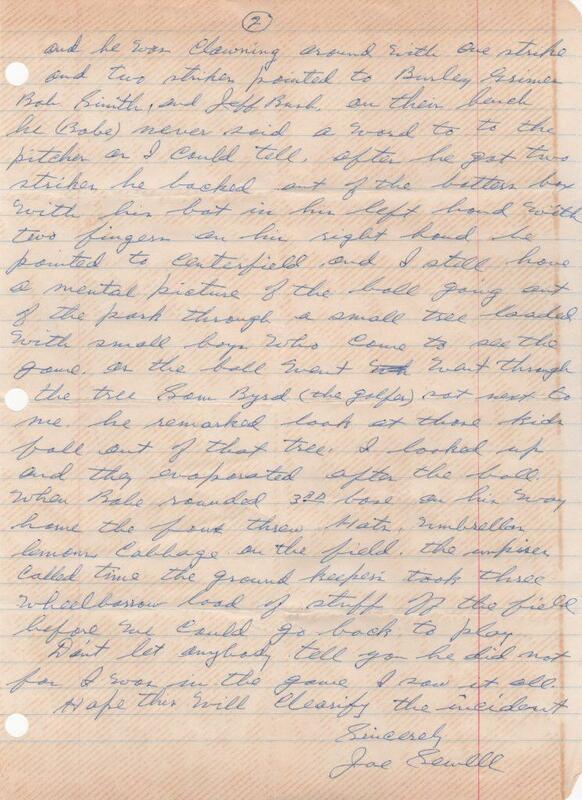 I had just hit a fly ball to Hack Wilson in left center…” Sewell goes on to recall a conclusive memory on the day on the second page of the letter. 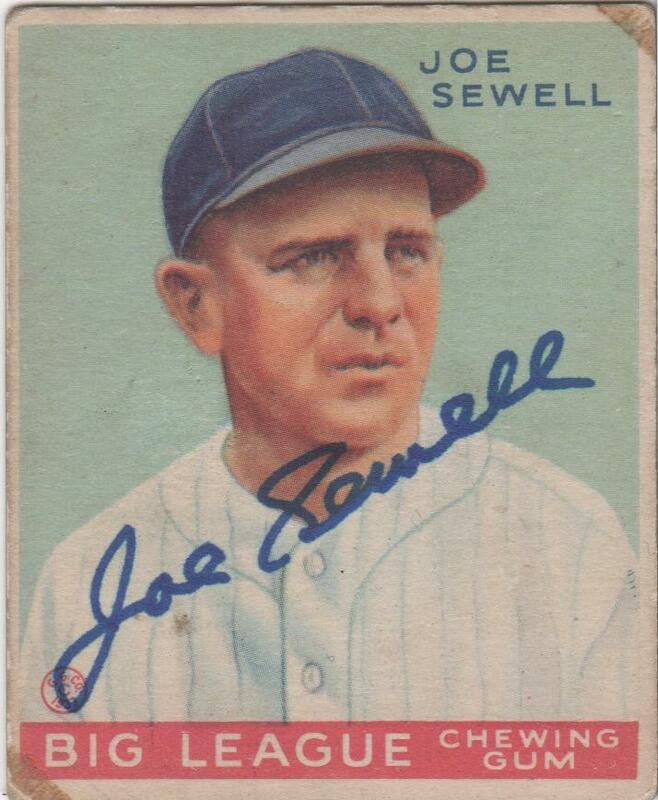 Goudey Gum Company’s iconic 1933 baseball card set is on display here complete with Joe Sewell’s autograph on this original vintage card. 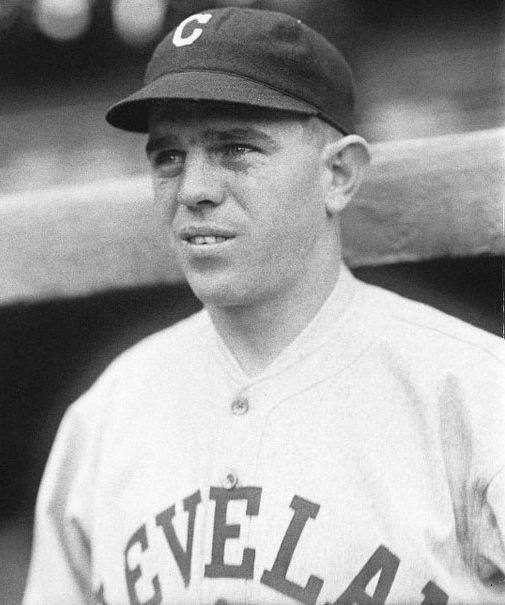 Sewell spent his first 11 years playing for the Cleveland Indians before signing with the Yankees as a free agent before the 1931 season. 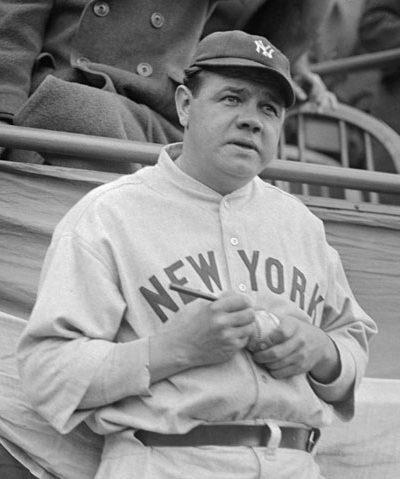 His first World Series ring came with the Indians in 1920; his second with the Yankees in 1932. In 1977 Hall of Fame third baseman Brooks Robinson mailed current and former stars of the game requesting their consent to lend their name to the Babe Ruth Foundation Advisory Board. 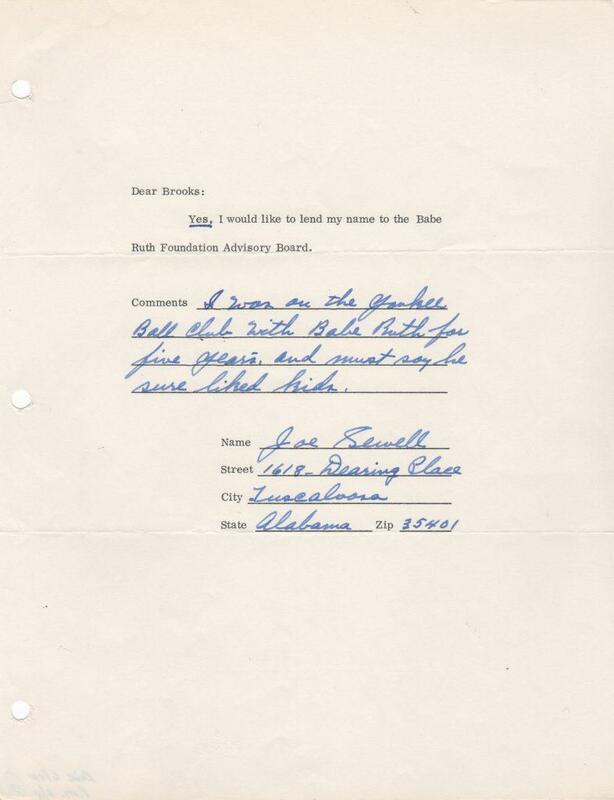 Dated the same year as his induction into the Hall, Sewell responds by writing, “I was on the Yankee Ball Club with Babe Ruth for five years and must say he sure liked kids.” At the bottom he pens his signature and writes his Alabama address. 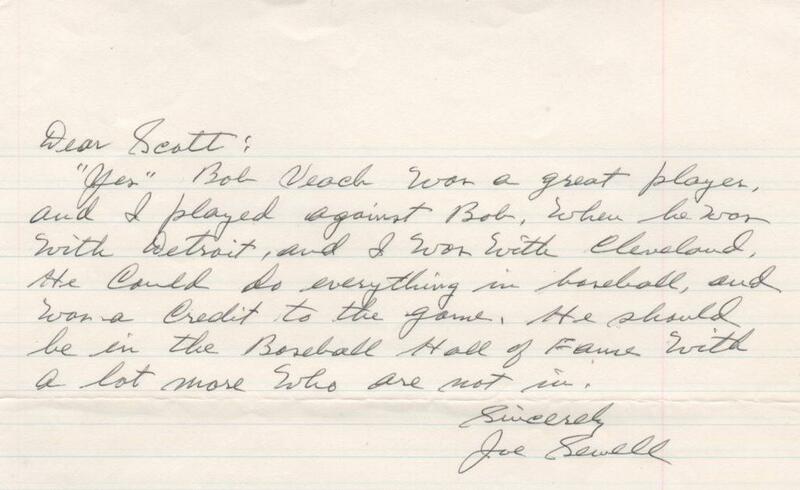 In this handwritten letter, Hall of Fame infielder Joe Sewell weighs in on the Hall of Fame debate regarding Bobby Veach. 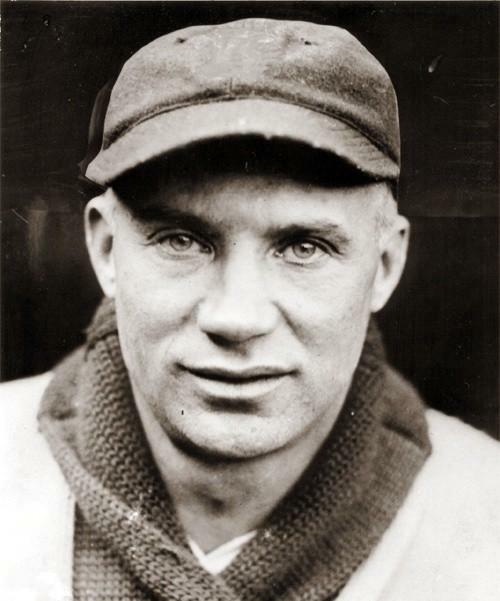 The former Tiger outfielder, Veach led all of Major League Baseball in runs batted in and extra base hits from 1915-1922. The three-time AL RBI leader, Veach finished with a .310 lifetime average. Is that enough to gain induction to Cooperstown? Bobby Veach’s statistical case for inclusion in Cooperstown is strong. A .310 lifetime average speaks loudly as do his three seasons of leading the AL in RBI. For the eight-year period spanning 1915-1922, Veach led all of baseball in extra-base hits and runs batted in. 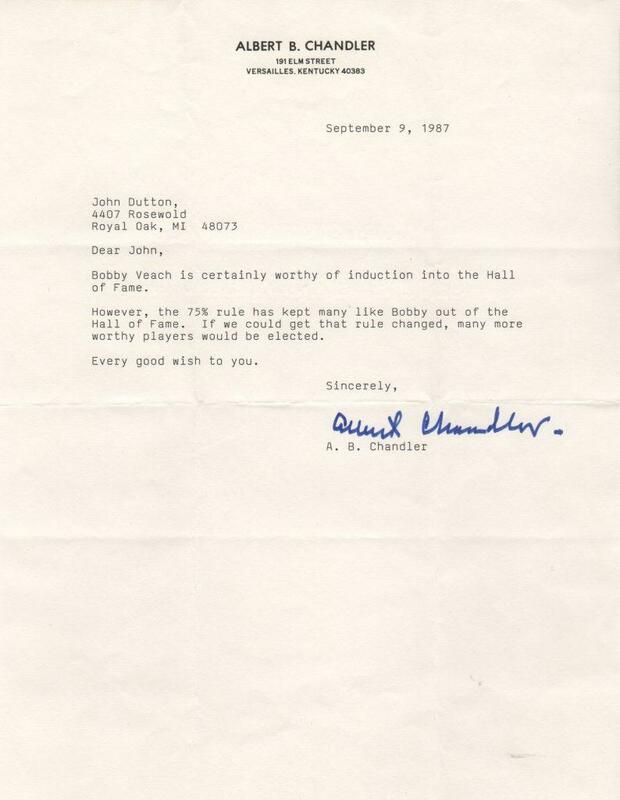 Like Joe Sewell, baseball’s second commissioner Happy Chandler believes Veach should be in. The former baseball chief’s opinion leaves little room for doubt. “Bobby Veach is certainly worthy of induction into the Hall of Fame,” Chandler writes in the letter shown above. The Sewell family has quite an association with Major League Baseball. 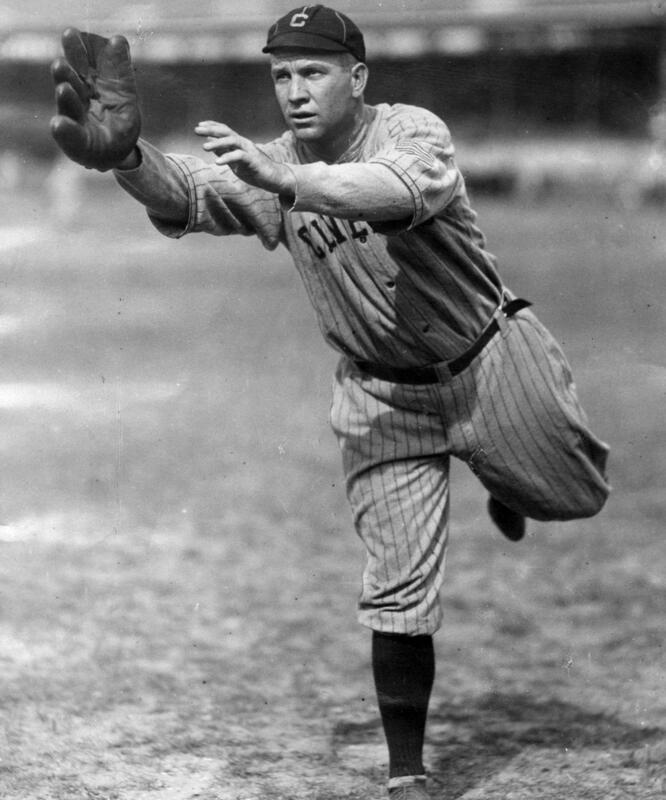 Not only is Joe Sewell in the Hall of Fame, but his brothers Luke and Tommy both played in the big leagues as did cousin Rip Sewell, the originator of the eephus pitch. 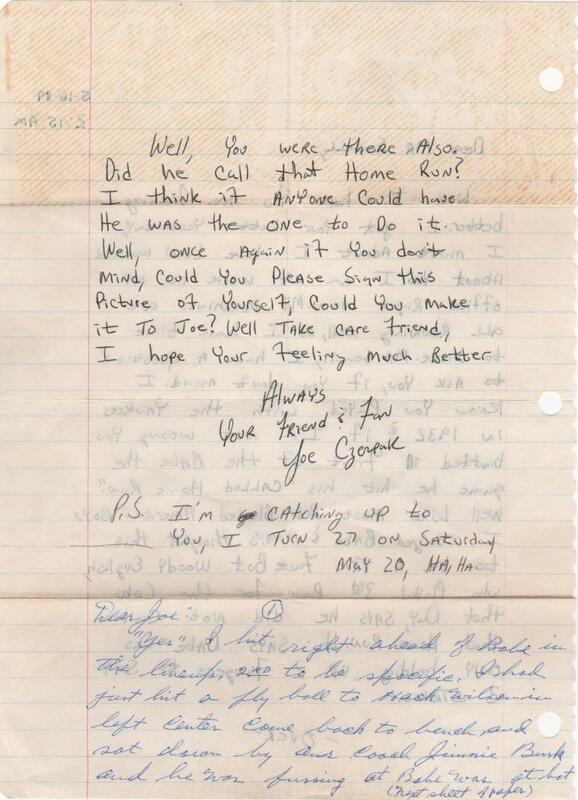 In this handwritten letter from February 14, 1978 Rip Sewell explains exactly how the eephus pitch was thrown. The Sewell family has quite an association with Major League Baseball. Not only is Joe Sewell in the Hall of Fame, but his brothers Luke and Tommy both played in the big leagues as did cousin Rip Sewell, the originator of the eephus pitch. 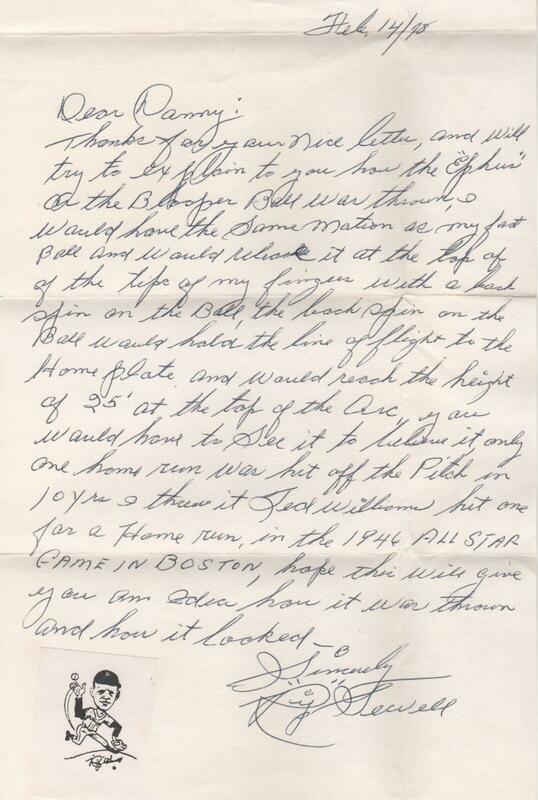 In this handwritten letter from February 14, 1978 Rip Sewell explains exactly how the eephus pitch was thrown. 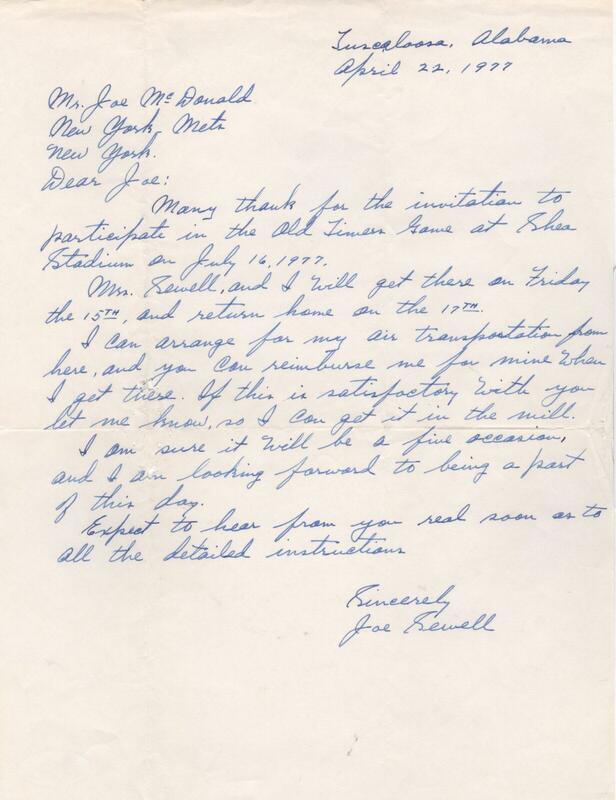 In content worth reading, Sewell starts out the letter thusly, “Thank you for your nice letter, and will try to explain to you how the ‘Ephus’ (sic) or blooper ball was thrown…” Sewell then goes on about arm angle, back spin, and the ball’s height. He even mentions that just one homer was ever hit off of the eephus — by Ted Williams in the 1946 All Star game.